The unforgiving terrain of the Amazon rain forest has allowed many indigenous tribes to protect their incredible ways of life far from the reach of modern society, but being cut off from the rest of the world also leaves them disadvantaged in some ways. Thankfully, there’s an organization that’s made it its mission to travel into these harsh locations and assist these tribes in an important way: by teaching them who Super Mario is. Wow. What a noble undertaking! The nonprofit group is called Super Mario Worldwide, and its important mission is simple: to do everything it can to spread awareness of Super Mario to those who have no idea who he is. The group’s members travel into inhospitable jungle territories, packing in all of their heavy Mario teaching supplies on their backs over many miles of rugged terrain to reach the remote tribes. Once contact is made with the tribal leaders and they gain permission to stay with the tribe, they immediately get to work on giving the tribe a crash course on everything there is to know about Super Mario—his lust for Princess Peach and ability to occasionally shoot fireballs from his hands. The group has only been active for four months, but it’s already done a ton of good. Even with the language barrier and the difficulty of explaining what a plumber is to people without plumbing, it’s been able to teach three tribes so far that Super Mario is the special Italian who goes insane for floating coins. And the cultural exchange is a two-way street. 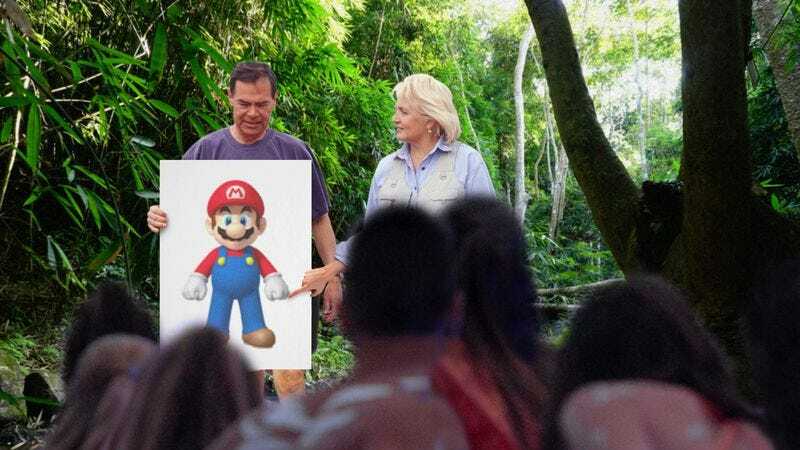 Walde and his crew were absolutely stunned when they came across one remote tribe, 150 miles south of Urucu, which already had a gleaming, 20-foot-tall statue of Super Mario in the middle of its settlement and were able to teach the volunteers some totally new things about Mario that Westerners have never before known. Those of us in the first world grow up with a lot of privilege, and we just take things like knowing who Super Mario is for granted. But word is getting out that there are still people who don’t have the slightest idea about Mario, and donations are starting to flow in from people all around the world to Super Mario Worldwide. If you’d like to see these tribes get the help they need, consider a donation or maybe even become a volunteer. There are people out there who could really use your help.